Kenneth Brady. Baby on Board. Editor Standey Schmidt has been beefing about SUVs in his editorials of late, so it was probably a heads-up play by Brady in submitting a story about them. Alan, an eco-warrior, objecting to the use of these gasguzzlers, takes pride in stealing, or rather, borrowing such vehicles, and giving them a taste of what going off-road really means. The AIs of the vehicles invariably get a taste for dirt under their tyres, and after returning them to their owners, he enables the AIs to network with others in an online road racing gaming VR. However, a humvee proves to be a particularly nasty piece of work, and this predatory AI has to be stopped. Sadly the destruction of, Timmy, the Land Rover AI with the cutesey boyish personality, had probably the opposite effect on me than that intended. Alan finds that the humvee’s personality is linked to some nefarious goings-on. Carl Frederick. The Fruitcake Genome. Short piece in which it transpires that SETI is looking in the wrong place : exo-messages appear to be encoded in the DNA of fruitflies. Grey Rollins. The Bambi Project. Good ol’ boys hunting deer find themselves up against genmod deers who don’t take kindly to being shot at. The odds are stacked against the hunters, and the deers prevail. Hmmm, maybe Rollings is trying to make a moral point with this story, but it’s buried w-a-y too deep for me to spot. A scientist with an autistic spectrum disorder is probing deeply into quantum mbrane theory, and ends up racing her AI, PI, to make contact with another self in another quantum reality. When PI beats her to it, the scientist is shattered. John G. Hemry. Small Moments in Time. A temporal interventionist travels back in time to 1917, to the scene of one of the outbreaks of the Spanish Flu which killed millions. Just as he is pondering the suspicious nature of the flu bug breaking out in three separate locations simultaneously, as the history books show, another chrononaut appears, leading him to immediately suspecting this guy as being responsible. It turns out that this new guy is travelling back in time to do evil in order to prevent another, much greater evil. Joe Schembrie. A Plague of Ruins. 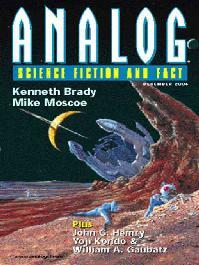 Your average scientist fiction Analog issue.